It’s the Halloween season, and what better way to spend it than with some (allegedly) true ghost stories? 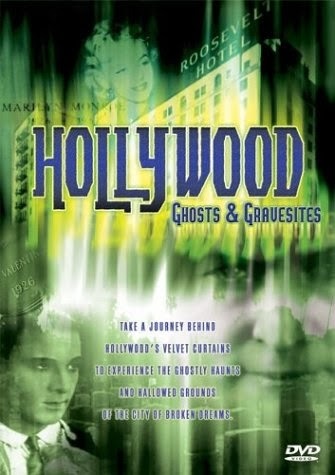 Being a movie fan, I figured 2003’s Hollywood Ghosts & Gravesites, which, by all accounts, provides a tour of some of Hollywood’s most haunted spots, would be a great way to kick things off. Hollywood Ghosts & Gravesites features everything from studio-bound spirits to ghosts who never checked out of the famous Roosevelt Hotel (some believe Marilyn Monroe and Montgomery Clift still haunt its hallways), and even stops by the graves of such celebrities as Rudolph Valentino and gangster Bugsy Siegel. It’s a crazy ride, and Hollywood Ghosts & Gravesites covers a lot of ground. Too much ground, actually, something that hurts the movie in the long run. In the opening scene, we’re introduced to historian Mark Wanamaker, who confidently declares “all the studios in Hollywood are haunted”. Unfortunately, the film glosses over many of these so-called “hauntings”, thus draining them of all their energy. Some stories are interesting, like the one where Sharon Tate spent the night in a house that used to belong to Paul Bern, the husband of Jean Harlow, who allegedly killed himself (we’re even shown a crime scene photo of Bern’s body lying in the bathroom). As the story goes, Tate awoke from a deep sleep to find a “little man” walking around the room, as if searching for something (after looking at some photos later on, she said she was sure the “little man” was Paul Bern). Frightened, she ran out of the room and down the stairs, only to encounter another spirit, that of a woman whose throat had been sliced open. It’s one of the film’s more chilling tales, yet is ultimately ruined by Wanamaker’s silly theory (he contends the female apparition Tate saw at the bottom of the stairs was, in fact, the actress getting a glimpse of her own future, when she’d be brutally butchered by Charles Manson and his followers. Seriously?) Aside from its lackluster ghost stories, the movie spends a lot of time visiting the final resting places of many Hollywood legends. At one point, we join a celebration commemorating the 75th anniversary of Rudolph Valentino’s death, with fans that weren’t even born at the time expressing their eternal devotion to the actor. Celebrity graves (and the fanatics who visit them on a regular basis) are indeed a fascinating topic, but not a particularly frightening one. With boring stories, ridiculous theories, and cemetery visits devoid of anything supernatural, Hollywood Ghosts & Gravesites proved a major disappointment.